Anti-bias, Sexual Assault, Counseling, etc. 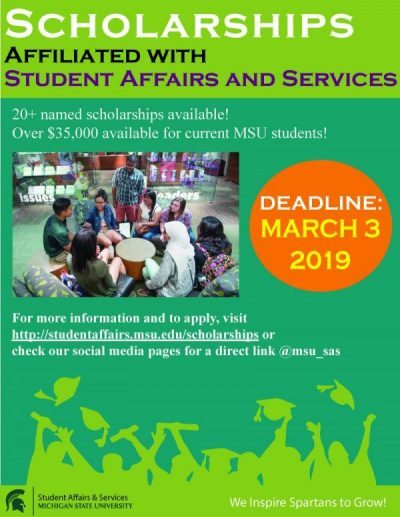 MSU Student Affairs and Services has more than 20 scholarships available for undergraduate and graduate students. The following scholarships are affiliated with Student Affairs and Services. Please click on the scholarships LINK to read more about the donor and the application criteria and process. 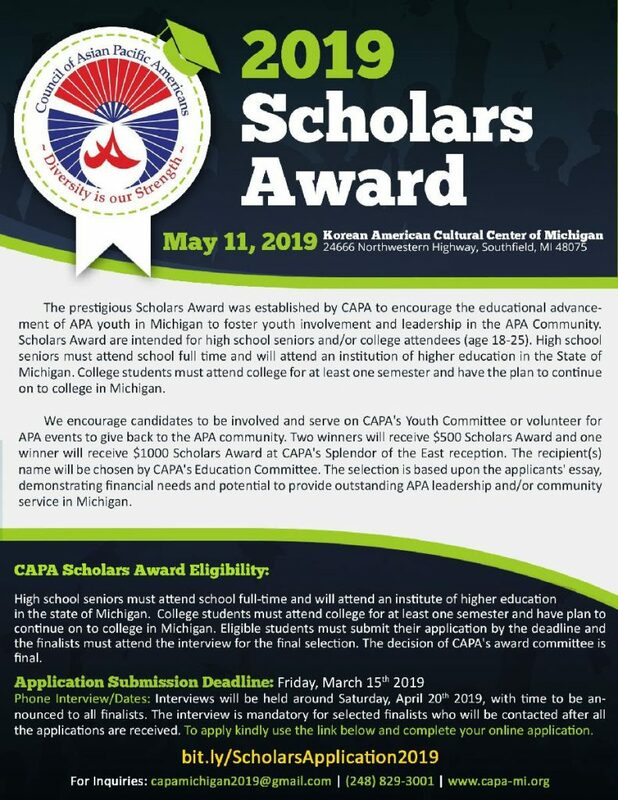 The deadline to apply for most of these scholarships is 11:55 p.m. on Sunday, March 3, 2019. HOWEVER, please make sure you read details of each scholarship for differences in deadline, requirements and submission processes. Questions? Contact Allison Tilma in the Office of the Vice President for Student Affairs and Services at (517) 355-7535 or email tilmaall@msu.edu. Office of Financial Aid for a listing of Scholarships & Grants. MSU Scholarship Search: MSU offers a wide variety of scholarships, some of which have criteria which severely limit the number of students who might be eligible, while others have much broader criteria. Office of Admissions Scholarship Search: The following scholarships are awarded to incoming freshmen who meet the criteria specified by the award. Satisfying the criteria does not guarantee that a student will receive a scholarship since the amount of funding may limit the number of awards that can be offered. Consideration for these awards is automatic. In some instances, an additional application is required. Check the searchable scholarship database for additional major-specific scholarships awarded directly by colleges and departments. The TOMODACHI Initiative seeks to provide grant funds to organizations that aim to foster a generation of American and Japanese leaders who commit to strong U.S.-Japan relations. Grants between $5,000 and $80,000 may be used to develop cross-cultural youth leadership, help underserved communities learn about foreign cultures, and bring diverse voices to the U.S.-Japanese relationship. Preference will be given to programs that focus on STEM or help young women succeed in the STEM or business fields. FirstEnergy supports teacher professional-development and classroom projects that focus on the STEM fields. K-12 educators and youth group leaders are eligible to apply for grant awards of up to $1,000. The Jack Kent Cooke Foundation College Scholarship Program is the largest undergraduate scholarship program available to high-achieving high school seniors with financial need who seek to attend the nation’s best four-year colleges and universities. In addition to the monetary award, Cooke Scholars receive comprehensive educational advising, significant cohort-based programming, and graduate school funding, as well as a thriving network of nearly 2,500 fellow Cooke Scholars and alumni. The SR Education Group offers a $5,000 scholarship open to students at least 16 years old with financial need enrolled at an accredited post-secondary academic institution. Applicants must submit an online application which includes two 300-500-word essays. Buenas Opiniones offers a renewable $2,500 scholarship, along with personal, leadership, professional development opportunities, as well as networking and mentorship. The scholarship is open to Latino high school seniors, community college students, and current college students. Applicants must submit a 500 to 1,000-word essay on their struggles as a Latino student. Scholarship application for female high school senior or full-time college students from the metro-Detroit area. With your new position I’m not sure if you work mostly with seniors, but I wanted to pass it along in case you did or if you know of people who would be eligible to apply. We are offering in conjunction with our Money Smart Week events. Students must answer the question: What does it mean to be Money Smart in your savings practices? Entries require a two-minute video that answers that question. Applications are asked to post on MSU Media Space and then complete a short application.